No one knows how the first organisms  or even the first organic precursors  formed on Earth, but one theory is that they didn't. Rather, they were imported from space. Scientists have been finding what looks like biological raw material in meteorites for years, but it's usually been shown to be ground contamination. This year, however, investigators studying a dozen meteorites that landed in Antarctica found traces of adenine and guanine  two of the four nucleobases that make DNA. That's not a big surprise, since nucleobases have been found in meteorites before. 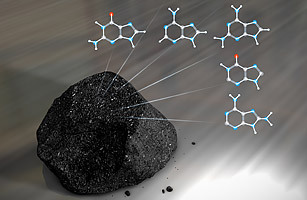 But these were found in the company of other molecules that were similar in structure but not identical. Those had never been detected in previous meteorite samples  and they were also not found on the ground where the space rocks landed. That rules out contamination  and rules in space organics. A little adenine and guanine in the company of other mysterious stuff is a long, long way from something living  but it's closer than we were before.